Chelsea and any other interested clubs can reportedly seal the transfer of Real Madrid playmaker Isco if they cough up as much as €120million. The Spain international is one of the finest attacking midfield players in Europe and it’s little surprise he would not come cheap despite his recent lack of first-team opportunities at the Bernabeu. Don Balon claim Real want €120m for Isco, though at the moment it’s suggested there are no clubs coming up with offers that close to that fee. 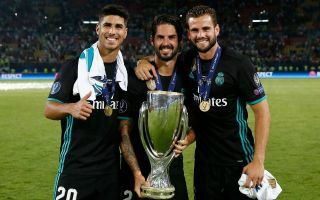 Chelsea were recently linked as Isco’s preferred destination by another Don Balon report following plenty of links with Premier League clubs of late. It remains to be seen if the Blues could afford that kind of fee, though the west Londoners could definitely do with a player of Isco’s calibre. The 26-year-old could make an ideal replacement for Eden Hazard as he nears the end of his contract at Stamford Bridge, while his versatility also means he could play in Cesc Fabregas’ role deeper in midfield. Isco also seems an ideal fit for Maurizio Sarri’s style of play, which may be why Don Balon recently stated they were his favoured next club.